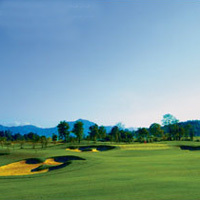 Chiang Mai Highlands was designed by Schmidt-Curley, the same creative team responsible for the redesign of Muang Kaew Golf Course in Bangkok and many of Asias exciting new courses. The course itself is set in the hills outside Chiang Mai, giving golfers the distraction of magnificent views on every hole. The design is exciting and challenging for a player of any level but offers the choice of 5 different tee locations making everyones day pleasurable. Opened December 24th 2005, Chiangmai Highlands is the newest course in the north and offers a golf experience beyond any other course in the region. Chiangmai Highlands has a superbly maintained practice facility with several practice greens, short game area and a 300 yard driving range with a passpallum grass tee. Its profound tranquility, high elevation, cool climate, fresh air, pure water, and fertile soil, form the perfect place to sculpt a living golf treasure. From the inviting downhill 1st hole, the golf course effortlessly flows along, gaining strength, beauty, and character with each passing hole until its thrilling, dramatic finish on the unforgettable 18th. If you only have one day to golf in the north, play Chiang Mai Highlands. This world-class resort is not to be missed!